Sozvezdiya.ru - Astronomy Encyclopedia. F.
Faber-Jackson relation Correlation, first noted by US astronomers Robert Jackson (1949- ) and Sandra Faber (1944- ), between the velocity dispersion of stars in an elliptical galaxy and the luminosity of the galaxy. Refined with a third parameter into the Fundamental Plane, this has become a valuable distance indicator, analogous to the tully-fisher relation for spiral galaxies. Fabricius, David (1564-1617) and Fabricius, Johannes (1587-1616) German father and son astronomers who made the first regular telescopic observations of sunspots, published in 1611. They noticed that these spots rotated with the Sun, so must be a part of the visible solar surface rather than small orbiting objects, and that the Sun itself must rotate, a theory proposed by Johannes kepler, with whom David Fabricius corresponded regularly. David Fabricius discovered the first known variable star, Mira, in 1596. Fabry-Perot interferometer Optical interferometer in which the two parts of the incoming beam are recombined after multiple partial reflections between parallel, lightly silvered, glass plates; the construction is called a Fabry-Perot etalon. interference of the light waves creates a very narrow-bandpass filter, which can be tuned by changing the spacing between the plates. It is capable of making extremely accurate measurements of the wavelengths of emissions in atomic spectra. faculae Exceptionally bright, irregular regions on the Sun visible in the white light of the photosphere, best seen in the regions near the limb where limb darkening increases the contrast. Faculae are usually associated with sunspots, and are brighter than the surrounding medium by virtue of their higher (by about 300 K) temperatures; they are closely associated with the chromospheric network and bright plage regions in the chromosphere. Faculae can precede the appearance of a sunspot, in the same place, by many hours or even a few days, and can persist in the same location for many months after the sunspots have gone. The number of faculae varies in step with the approximately 11-year solar cycle , with a greater number when there are more sunspots. The increased solar brightness as a result of faculae is greater than the decrease caused by sunspots, so there is an overall increase in the solar constant at the maximum of the sunspot cycle. Polar faculae, occurring at much higher latitudes than the sunspot-forming regions, are common in the rising phase of the solar cycle. falling star Popular (chiefly US) non-scientific description of a meteor. False Cross Cross-shaped asterism (star pattern) in the southern sky made up of i and e Carinae and k and 8 Velorum, all of second magnitude. It is often mistaken for the southern cross, but is larger and dimmer. far-infrared Region of the electromagnetic spectrum between around 25 and 350 jm. This region is only observable from space, because far-infrared radiation is absorbed by Earth's atmosphere. Very cool objects (most notably active galaxies), and the dust in interstellar space, emit strongly in this range. See also infrared astronomy observations of the Universe by previous ultraviolet explorers, with greater sensitivity and resolving power. FUSE will help to answers some fundamental questions about the first few minutes of the big bang, studying the cosmic abundance of deuterium, the heavy hydrogen isotope. It will also study the dispersal of chemical elements in galaxies and the properties of hot interstellar gas clouds. Fast Auroral Snapshot Explorer (FAST) NASA satellite launched in 1996 August, carrying four instruments to study the creation and content of aurorae. Plasma and electron temperature data are collected by electric field detectors, magnetic field data by a magnetometer and data on electrons and ions by electrostatic analysers. Faulkes Telescope Project to build two fully robotic 2-m (79-in.) telescopes for use principally by British educational institutions over the Internet. The telescopes will be located on the island of Maui in Hawaii and at siding spring observatory in Australia, and will provide coverage of the night sky during UK daytime. fault Fracture or fracture zone along which there has been displacement of the fracture sides relative to one another. A fault is typically formed by tectonic deformation of the outer solid parts of planets and satellites. Depending on the character of the displacement, several varieties of faults are distinguished. Normal faults are produced when displacement is essentially vertical and the hanging wall is depressed relative to the footwall. Strike-slip faults result when displacement of one side relative to the other is essentially horizontal. Faye, Comet 4P/ Short-period comet found by Herve Faye (1814-1902), a French amateur astronomer, in 1843, and recovered in 1850 following a prediction by Urbain le verrier. The period is 7.34 years, and the comet was last seen in 1999-2000. The orbit has undergone some modification following close passages to Jupiter, and the comet is apparently becoming progressively fainter. fermion Elementary particle that has a spin of , is antisymmetric and represent the material side of the quantum world. Fermions obey a particular type of statistics characterized by a Fermi distribution. far-ultraviolet Region of the electromagnetic spectrum that extends roughly from the end of the extreme-ultraviolet near 75 nm to the edge of the near-ultraviolet at around 300 nm (the near-ultraviolet extending to the optical). FG Sagittae Very unusual VARIABLE STAR, having changed from a blue SUPERGIANT to a red supergiant during the 20th century. Before 1900 FG Sagittae was a normal blue star evolving to become a white dwarf. In 1901, however, it suddenly started to brighten in the photographic (visual) and blue magnitude, and it brightened during most of the 20th century. The temperature dropped from over 10,000 K to about 4500 K, and at one point (around 1965) it was dropping by 250 K per year. The star has been variable for several decades, passing through the Cepheid INSTABILITY STRIP. In 1992 FG Sagittae's brightness faded by several magnitudes in a manner similar to the fadings of the R CORONAE BOREALIS STARS (although the star is not as deficient in hydrogen as are the R Coronae Borealis variables). There have been several more fading episodes since 1992. The dust clouds, which dim the light during these fading episodes, have a temperature between 700 K and 1000 K. FG Sagittae is a solar-mass star, and although similar to the unusual star SAKURAI'S OBJECT it evolves along a different track in the HERTZSPRUNG—RUSSELL DIAGRAM because it is less massive. Convection currents in the star's atmosphere have brought up material such as yttrium, zirconium, cerium and lanthanum (SPROCESS elements) from deep inside the star, so its composition appears abnormal. The star is surrounded by the PLANETARY NEBULA it created around 6000 to 10,000 years ago, and the composition of the nebula is completely normal. 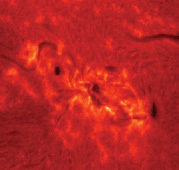 fibril Linear dark structure in the solar CHROMOSPHERE seen in association with ACTIVE REGIONS. Fibrils are thought to mark out the chromospheric magnetic field. They are visualized in SPECTROHELIOGRAMS taken in the light of the HYDROGEN-ALPHA LINE. field curvature Distortion produced by an astronomical telescope, leading to differences in scale across an image's width. Field curvature results from the fact that the image formed is not really flat, but is in fact a curved 'surface' on a concave sphere. An EYEPIECE will focus best at differing positions across the field. Photographic plates on SCHMIDT CAMERAS used for astrometry are curved to match the field curvature of the instrument. field equations Term generally used to refer to Einstein's general relativistic field equations. These equations form the basis for Einstein's laws of gravity and essentially relate the curvature of SPACETIME to the presence of mass and energy. In his theory of SPECIAL RELATIVITY, Einstein showed that matter and energy are equivalent, and related by E = mc2, which implies that energy also has to be included in any gravity calculation. So in the field equations, both mass and energy are represented by a quantity called the stress-energy tensor T . This tensor is the source of the gravitational field. The field equations also describe how spacetime is warped by the presence of the gravitational sources. The curvature information is contained in two quantities, the Riemann tensor (R^v) and the Riemann scalar R. The geometry of the coordinate system is also included in the field equations and is represented by the quantity g , called the metric tensor. Together, the field equations are where G is Newton's universal constant of gravitation and c is the speed of light. The indices \l and v represent each of the dimensions: length, width, height and time. Thus the equation above is actually 16 independent equations (42) that must be solved simultaneously. The major solutions of the field equations are the Schwarzschild solution for spherical geometry, the Kerr—Newmann solution for rotating black holes, and the Robertson—Walker metric for the entire universe. field rotation Circular movement of a telescope's field of view as a result of DIURNAL MOTION when using an instrument that is either on an altazimuth mounting or an equatorial mounting whose polar axis is not properly aligned on the celestial pole. An image taken using such a system will show short star trails concentric with the field centre. A device called a field de-rotator is used to counter-rotate the image plane to allow long exposures through instruments with altazimuth mounts, as used with the majority of large modern professional telescopes. filament Dark, elongated, ribbon-like structure visible in SPECTROHELIOGRAMS of the Sun taken in the light of the HYDROGEN-ALPHA LINE or the H and K lines of calcium. A filament is a PROMINENCE seen in projection against the bright solar disk. filament Seen in projection against the bright solar disk in spectroheliograms, prominences appear as dark filaments by contrast, as at top right in this image. filamentary nebula Interstellar nebula in which the material is in the form of highly elongated and often highly twisted intertwined clouds. Many nebulae of many types have filamentary structures within them, so the term filamentary nebulae is reserved for those nebulae in which the filaments make up the whole or the largest part of the nebula. The VEIL NEBULA, a SUPERNOVA REMNANT, is the best-known filamentary nebula. filter Optical element that absorbs some wavelengths of light whilst transmitting others. Filters are used to great effect in astronomy to isolate certain colours or wavelengths, making them easier to observe or analyse. The most common are filters made of coloured glass or gelatin. In visual astronomy these are used to improve the contrast in planetary features. For example, if a light blue filter is used to observe Jupiter, the Great Red Spot will appear darker than normal so will stand out against the surrounding body of the planet. Similarly, a red filter will show up dark features on the surface of Mars. Colour filters are also used with monochromatic detectors such as photographic plates and CCD cameras. Taking three separate images through red, green and blue filters, then recombining them in the dark room or electronically will produce true-colour images. Interference filters are made of many layers of dielectric deposited on a glass substrate. Thirty or forty layers may be used to produce the exact characteristics needed. In this way, sky glow caused by mercury and sodium street-lights can be rejected whilst hydrogen and oxygen light from faint nebulae is allowed through. Interference filters designed to pass only one sharply defined wavelength are called monochromatic filters. Special solar filters are available for observing the Sun directly. High-density filters that cut out 99.999% of the incoming sunlight are used at the entrance aperture of a telescope to enable sunspots, faculae and surface granulation to be observed directly. Interference filters are used to reveal flares and prominences. Observing the Sun directly carries risk so advice should be sought from a specialist retailer or observatory before using a solar filter. finder Small, low-powered TELESCOPE with a wide field of view, attached to the tube of a larger instrument for the purpose of more easily locating celestial bodies. The narrow field of view of a large telescope can make locating faint objects in particular quite difficult. The finder allows the observer to study a wide area of sky, and the two telescopes should be aligned so that when the object in question is centred on the cross wires of the smaller telescope, it appears in the centre of the field of view of the larger one. fine structure Splitting of orbital energy levels. An atomic energy level for an orbiting electron is finely divided into substates as a result of the electron's ability to have different quantized angular momenta; to these substates is added splitting caused by the magnetic coupling between the electron's spin and its orbit. Each orbital level n of hydrogen has n substates, each of which (except for the first) is split in half. Multiple electrons' effects are combined. Transitions between fine structure states create the complex spectra of atoms heavier than hydrogen. fireball Meteor of magnitude — 5 or brighter, exceeding the brilliance of the planet Venus. On average, about one meteor in a thousand attains fireball status. Such events are quite commonly seen during the major meteor showers such as the perseids or gemimds. Fireballs are produced by larger meteoroids; they are associated with the arrival of substantial (centimetre-sized and upwards) fragments of asteroidal debris, which can on rare occasions survive atmospheric passage to be recovered on the ground as a meteorite. An exploding fireball producing a sonic boom may be described as a bolide. FIRST Abbreviation of the Far Infrared Submillimetre Telescope, renamed the herschel space observatory. first contact In a solar eclipse, moment when the Moon's leading (easterly) limb first appears to align tangentially with the westerly limb of the Sun. In a lunar eclipse, first contact refers to the moment when the Moon's easterly limb first encounters the western edge of the umbra of Earth's shadow. In either instance, first contact is the beginning of the eclipse. first light Term used to describe the first occasion on which a newly constructed telescope is used to observe a celestial object. This will occur only after all the optical components have been fully aligned but it will usually be some considerable time before the instrument is brought into full use, since a large amount of testing and calibrating will still be required. Whilst normally used to refer to an optical telescope, the term is also applied to instruments operating at other wavelengths; for example the first time that a radio telescope detects signals from space. First Point of Aries Position on the celestial sphere where the Sun's centre crosses the celestial equator from south to north at the time of the vernal equinox, on or around March 21 each year. This marks the intersection of the ecliptic with the celestial equator at the Sun's ascending node; it is used as the zero point for measuring celestial longitude, right ascension and sidereal time. Thus, when the First Point of Aries is exactly on an observer's meridian, the sidereal time is 0h 0m 0s. The small annual change in position of the celestial pole, known as precession, has caused this point on the celestial sphere to move slowly westwards along the ecliptic by about one-seventh of an arcsecond each day, taking a period of around 25,800 years to complete a single revolution. Because of this, although originally located in the constellation of Aries, from whence it derived its name, it is has now drifted into neighbouring Pisces, although the name has remained unchanged. First Point of Libra Position on the celestial sphere where the Sun's centre crosses the celestial equator from north to south at the time of the autumnal equinox, on or around September 23 each year. The effects of precession have caused it to move slowly westwards along the ecliptic by about one-seventh of an arcsecond each day, taking a period of around 25,800 years to complete a single revolution. This means that it is no longer located in Libra, but instead has drifted into the constellation of Virgo. Fish's Mouth Region of dark nebulosity within the orion nebula, close to the trapezium stars (RA 05h 35m.3 dec. —05°23'). Fitzgerald contraction (Lorentz-Fitzgerald contraction) Shrinkage in the lengths of moving objects that was suggested in 1889 by the Irish physicist George Francis Fitzgerald (1851-1901) and, independently, by Hendrick lorentz, to explain the null result of the michelson-morley experiment. fixed star Term used in antiquity to describe those stars that appeared to remain static, relative to one another, on the celestial sphere, as opposed to the 'wandering stars' or planets. It was believed that the Earth lay at the centre of the Universe, surrounded by a solid crystal sphere to which the 'fixed stars' were attached. Nowadays, the term is used to describe those stars that have no detectable proper motion. Fizeau, (Armand) Hippolyte (Louis) (1819-96) French physicist who in 1849 made the first successful measurement of the velocity of light in an experiment carried out wholly on the Earth. He used a rapidly rotating toothed wheel which interrupted a fine beam of light before and after reflection from a distant mirror more than 8 km (5 mi) away. Fizeau collaborated with Leon foucault in his optics experiments. Flame Nebula emission Nebula in the constellation Orion, immediately east of Ј (RA 05h 41m.9 dec. — 01°51'). The Flame Nebula has a diameter of 30' and is split into two sections by a dark lane running north-south. Difficult to see visually thanks to its proximity to Ј, the nebula is conspicuous on long-exposure photographs of the Orion's Belt region. Flammarion, (Nicolas) Camille (1842-1925) French astronomer and prolific author of popular astronomy books, including LAstronomie populaire (1879). He worked first (from 1858) at Paris Observatory, then from 1883 at his private observatory at Juvisy-sur-Orge, where he made serious studies of double stars and the planets using a 9.5-inch (240-mm) Bardou refractor. Flammarion's epic two-volume work La Planete Mars et ses conditions d'habitabilite (1892, 1909) is an authoritative history of Mars observing which speculates about the possibility of life there. Flamsteed, John (1646-1719) English astronomer and clergyman, the first astronomer royal and director of the Royal Observatory, Greenwich. He was a youthful convert to Copernicanism, admired Galileo and Kepler, and was deeply influenced by Tycho Brahe's insistence upon precise observation as the basis for theory. In 1675 he was requested by the Royal Society to examine a method for finding longitude at sea proposed by the sieur de St Pierre. Flamsteed's report, in which he stated that the longitude could not be reckoned until superior astronomical tables became available, caught the attention of King Charles II, who ordered the creation of the post of Astronomer Royal and the founding of the Greenwich Observatory. In spite of the royal appointment, Flamsteed had to pay for the observatory's instruments out of his own pocket. At Greenwich, Flamsteed's task was to make accurate positional measurements of the Moon and stars for use in navigation. He pioneered three new precision instruments that transformed observation: the telescopic sight and the micrometer, both invented by William GASCOIGNE, and Christiaan Huygens' pendulum clock for timing star transits. He was a meticulous observer, and with instruments made by the clockmaker Thomas Tompion (1639-1713) he was able to measure the positions of stars and planets to within 10", over 40 times more accurately than Tycho Brahe had managed with his equipment. Observing every clear night for over 40 years at Greenwich, Flamsteed produced a body of data that set new standards in astronomical research. However, as something of a perfectionist he was slow to release his results, to the irritation of Isaac NEWTON, and objected when the Royal Society published his uncorrected observations. The catalogue of his corrected observations, the Historia coelestis brittanica, was not published until 1725, after his death; the numbers assigned to stars in this catalogue (FLAMSTEED NUMBERS) are still in use. While his tables were still not sufficiently accurate to find longitude, they proved fundamental to Newton's work on the lunar theory. Flamsteed numbers Sequence of numbering of the stars by constellation in order of right ascension, for purposes of identification. The numbers were assigned by later astronomers to stars in John FLAMSTEED's posthumously published star catalogue. The most westerly star listed in Leo, for example, was designated 1Leonis. Many stars are still best known by their Flamsteed designations. flare Sudden, violent explosion on the Sun, lasting from a few minutes to a few hours; the local effects may persist for several days. Flares accelerate charged particles out into interplanetary space and down into the Sun. They emit ELECTROMAGNETIC RADIATION across the full spectrum. The frequency and intensity of solar flares increases near the maximum of the SOLAR CYCLE, and they are associated with ACTIVE REGIONS. flare Violent releases of magnetic energy in the inner solar atmosphere above active regions are seen in spectroheliograms as bright patches or ribbons, described as flares. Flares are most common at times of high sunspot activity. Flares originate in the low CORONA, where magnetic energy is built up and stored in the magnetic fields of active regions. The flares are frequently triggered in compact structures just above the tops of coronal loops, where magnetic fields of opposite polarity are drawn together, releasing large amounts of stored energy (up to 1025 Joule) by MAGNETIC RECONNECTION. Every second, the PHOTOSPHERE emits light with an energy that is at least one hundred times greater than the total energy emitted by any flare. Therefore, only exceptionally powerful flares can be detected in the glare of visible sunlight. The first such white-light flare to be observed and recorded was seen by two Englishmen, Richard C. CAR-RINGTON and Richard Hodgson (1804-72), who noticed an intense brightening lasting for just a few minutes near a complex group of sunspots on 1859 September 1. Routine visual observations can be made by tuning into the red emission of the HYDROGEN-ALPHA LINE. Light at this 656.3 nm wavelength originates in the CHROMOSPHERE. When viewed in this way, solar flares appear as two extended parallel ribbons on either side of the magnetic neutral line. Flares have been classified according to their area in hydrogen-alpha light, with an importance ranging from 1 to 4 that corresponds to an area from 2 to more than 25 square degrees. Since flares reach temperatures of tens of millions of degrees, they emit the bulk of their energy at X-ray wavelengths of about 0.1 nm. A large flare can briefly outshine the Sun in X-rays. The X-ray radiation of flares is emitted as Bremsstrahlung (see FREE-FREE TRANSITION). Hard X-rays (in the region 10-100 keV) are emitted during the impulsive onset of a solar flare, while soft X-rays (1-10 keV) gradually build up in strength and peak a few minutes after the impulsive emission. During the impulsive phase, high-speed electrons are accelerated to energies of 10 to 100 keV and hurled down the magnetic conduit of coronal loops into the dense chromosphere, where they create double, hard X-ray sources. Plasma heated to temperatures as high as40 million K then expands upwards, by a process known as chromospheric evaporation, into the low corona along magnetic field loops that shine brightly in soft X-rays. Because solar X-rays are totally absorbed in the Earth's atmosphere, X-ray flares must be observed from spacecraft. Flares can be characterized by their brightness in soft X-rays, as observed by monitoring satellites such as the Geostationary Operational Environmental Satellites (GOES). The classification shown here provides a good indication of the energy output and likely terrestrial effects of a flare. Solar flares beam energetic charged particles along a narrow trajectory that follows the spiral shape of the interplanetary magnetic field in the SOLAR WIND. If a flare occurs in just the right place, west of the central meridian and near the solar equator, the accelerated particles can follow the field to Earth, threatening astronauts and satellites. The time taken for particles to reach Earth depends on their energy, taking roughly an hour for a particle energy of 10 MeV. RADIO WAVES from flares are valuable for studying their physical properties. 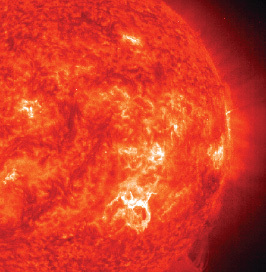 Flares can outshine the entire Sun at radio wavelengths. There are two main types of metre-wavelength radio flares, designated as type II and type III radio bursts. Type II bursts are thought to be caused by shockwaves moving outwards at velocities of about 1000 km/s (600 mi/s). Type III bursts are interpreted in terms of electron beams moving outwards through the corona at 0.05 to 0.2 times the speed of light. Type II bursts occur much more rarely than type III. The energetic electrons that produce the impulsive, flaring, hard X-ray emissions also emit synchrotron radiation at microwave (centimetre) wavelengths. flare star (UV) Red dwarf star that exhibits sudden, short-duration flares with amplitudes ranging from a few tenths of a magnitude to 6-7 magnitudes at visible wavelengths. Flare stars are of late spectral types, dKe-dMe. During flares, the stellar emission lines become enhanced and a strong blue-ultraviolet continuum appears, giving a greater amplitude in the ultraviolet. The rise time is a few seconds to a few tens of seconds, and the decline lasts a few minutes to a few tens of minutes. The initial decline is usually rapid and may be followed by a short standstill and then a quasi-exponential decay. Small precursors or pre-flares are sometimes observed and occasionally slow rising flares are also seen. The stellar flare light is seen against the relatively faint light from the normal quiescent star, which has a cool photosphere at 2800-3600 K. At maximum optical brightness the larger flares may contribute more than 10 to 100 times the total output of the whole visible stellar hemisphere. Since the photographic discovery by Ejnar HERTZSPRUNG in 1924 of DH Carinae, the first flare star, over 1500 have been found. Good examples of this class of object (and their apparent visual magnitudes) are UV CETI (13.0), AD Leonis (9.4), EV Lacertae (10.1), PROXIMA CENTAURI (11.0) and BY Draconis (8.2). Membership of binary star systems appears to be moderately common among flare stars, notably among those stars that also show activity similar to that of the BY DRA-CONIS STARS. Classical photographic spectroscopy has shown that during flares the Balmer emission lines of hydrogen become greatly enhanced, as do many other lines, for example of helium, calcium and other metallic elements. Modern techniques, using fast pulse-counting photometry, spectroscopy with sensitive CCD detectors, as well as satellite observations from above the Earth's atmosphere, have recently revealed that flare stars are amongst the most active stellar objects in our Galaxy, and that flare energies are often 1000 times their solar counterparts. In the variable-star classification, flare stars are designated 'UV' after UV Ceti, the prototype. Collaborative international observations are an essential part of present-day flare star research, where large numbers of hours are devoted to a few selected stars, and it is necessary to collect simultaneous spectral, optical, radio and X-ray data. In the far-ultraviolet, the International Ultraviolet Explorer (IUE) satellite registered strong emission enhancements of doubly ionized magnesium, the carbon and silicon ionic species up to CIV and SiIV and also the high-temperature nitrogen line, NV, reminiscent of the solar outer atmosphere. Furthermore, micro-flaring in a few dMe stars has been observed simultaneously in both optical spectra and in coronal X-rays, which suggests that some stars are frequently active at a timescale of a few seconds to great heights above the stellar surface. Flare stars are thought by some to be spotted stars with overlying active atmospheric layers that correspond to the extremely wide range of observed temperatures, from 3000 K in the spots, through 10,000 K to 200,000 K in the chromosphere and transition region, to more than 1 million degrees in the corona. The flare mechanism is poorly understood, although magnetic fields associated with differential stellar rotation are probably the cause. The low mass of the nearby dMe stars (many are less than 0.1 solar mass), and their relatively young age, means that steady thermonuclear burning in the interior, which maintains normal MAIN-SEQUENCE stars with radiative cores, may not yet have established itself. Wholly convective interiors may occur in the youngest stars of the lowest mass, and flaring appears to be a consequence of these instabilities, linked with complex magnetic fields. Difficult theoretical problems need to be solved as to the source and storage of energy prior to flares and their role in heating the intense stellar coronae. A related subtype of flare stars is designated UVN. These stars are closely associated with nebulosity and are somewhat similar to the Orion variables, RW AURIGAE and TTAURI-type stars found in the region of the ORION NEBULA, the PLEIADES and most young galactic clusters (age a few million years and less). UVN stars abound in regions rich in dust and gas where star formation is still in progress. Because they are generally very faint (apparent visual magnitude 12 to 20), these flare stars have almost invariably been discovered with large Schmidt telescopes, and those known today required several thousand hours of patient observations and searching of photographic plates. Flares of amplitude 4-6 mags. in the ultraviolet are fairly common among the fainter of these stars. There are more than 400 such flare stars in and around the Orion Nebula and approximately the same number in the Pleiades. Flares have also been observed in Praesepe, the Hyades, and the Cygnus and Taurus dark clouds. These abundant objects occur at earlier spectral types (dK0 to dM6) than other flare stars and were consequently differentiated by the name 'flash stars'. Although little is known about these stars, there is good evidence that flares occur in quite a variety of objects, including, for example, the more massive RS CANUM VENATICORUM STARS, which are binaries with G-or K-type subgiant components. flash spectrum Emission spectrum of the solar CHROMOSPHERE briefly seen during a total solar eclipse at the beginning and end of totality. It flashes into view for only a few seconds when the Moon completely covers the PHOTOSPHERE. 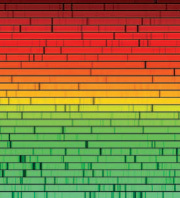 The lines of the flash spectrum correspond to those seen as dark FRAUNHOFER LINES in the spectrum of the bright photosphere. Fleming, Williamina Paton (1857-1911) Scottish-born astronomer who worked at Harvard College Observatory where, despite her lack of a formal higher education in astronomy, she developed a comprehensive system for classifying stellar spectra. Fleming and her husband emigrated to the USA in 1878, but he soon abandoned her, leaving her pregnant and destitute. Edward C. PICKERING, director of Harvard College Observatory, originally hired Fleming in 1881 as his housekeeper. Pickering, dissatisfied with the quality of work of his male assistants, complained that his maid could do a better job, and paid her as a temporary 'computer' at the observatory. He had just embarked on a major project to obtain large numbers of stellar spectra using an OBJECTIVE PRISM, and required a new system of classifying the many spectra that were being recorded. Fleming's astronomical computing work was of such high quality that Pickering quickly gave her a permanent position. When she developed her own scheme for classifying stars according to their different spectra, he placed her in charge of the project, the outcome of which was the henry draper catalogue. She supervised many other female computers, using the 'Pickering-Fleming' alphabetical classification scheme (later refined by Annie Jump CANNON) to catalogue the spectra of 10,351 stars, published in 1890 as the Draper Catalogue of Stellar Spectra. During this time, she developed the first rigorous standards for measuring the photographic magnitudes of variable stars. In 1898 Fleming took charge of Harvard's rapidly growing collection of photographic plates, which she examined to discover 59 new nebulae, 222 variable stars and 10 novae - a major accomplishment, given that only 28 novae were known at the time. Fleming also discovered 94 WOLF-RAYET STARS and the first examples (1910) of WHITE DWARFS. flickering Rapid variations in brightness over times of minutes, or even seconds, observed in many close BINARY STARS, especially NOVAE and DWARF NOVAE. flocculi Bright, coarse, mottled pattern marking the chromospheric network. It is seen in SPECTROHELIOGRAMS of the Sun and is most noticeable in the H and K lines of ionized calcium, CaII. Flora MAIN-BELT ASTEROID discovered in 1847; number 8. Flora is c.162 km (c.101 mi) in size. It is the archetype of a well-known HIRAYAMA FAMILY. FORNAX (gen. fornacis, abbr. for) Small, inconspicuous southern constellation, representing a furnace, between Sculptor and Eridanus, introduced by Lacaille in the 18th century. Its brightest star, a For, is a binary with pale yellow components, mags. 3.8 and 7.0, separation 4".5, period 314 years. Deep-sky objects include NGC 1365, a 9th-magnitude barred spiral galaxy; NGC 1316, another 9th-magnitude spiral, the optical counterpart of radio source Fornax A; and the Fornax Dwarf Galaxy, a dwarf spheroidal galaxy in the local group, about 450,000 l.y. away. focal length Distance between the centre of a lens or mirror and its focal point or focus. The focal length of a converging lens can be measured by forming an image on a sheet of paper of a window on the opposite side of a room. The distance from the lens to the paper is the approximate focal length. focal plane Plane through the focal point at right angles to the optical axis in which the image of a distant object will be formed. Some optical systems, such as the schmidt camera, produce an image that is in focus on a curved surface rather than on a flat plane. focal ratio Ratio between the focal length of a lens or mirror and its effective aperture. The focal ratio is often called the f-number. For example, a mirror of diameter 100 mm and focal length 800 mm would have a focal ratio of eight. This is often written as f8 or Jj8. It is a measure of how quickly light rays at the edge of the aperture converge as they approach the focus; astronomers sometimes refer to optical systems with low f-numbers as 'fast' and those with high f-numbers as 'slow'. following (f) Term used to describe a celestial body, or feature on a body, that trails behind another in their apparent motion. Following features come into view later than the reference feature. For example, in a group of sunspots, the following spot is the last to appear as the Sun rotates, while the following limb of the Moon is the one facing away from its direction of travel. Any feature that appears earlier than a reference feature is said to be preceding. Fomalhaut The star a Piscis Austrini, visual mag. 1.16, distance 25 l.y., spectral type A3 V. Infrared observations have shown that it is surrounded by a protoplanetary disk of dust from which a planetary system may be forming. The name is an abbreviation of the Arabic term meaning 'mouth of the southern fish', which is what it represents. forbidden lines emission Lines found particularly in the spectra of gaseous nebulae and in the corona of the Sun that are absent in terrestrial spectra because the required physical conditions cannot be satisfied in the laboratory. Emission lines result from transitions of an atom from a high energy level to a lower level (as a result of collisions or radiative decay from a yet-higher level), resulting in the emission of photons with characteristic energies or wavelengths. Transition probabilities depend on how the individual quantum states interact with each other. Under simplified mathematical treatment, only transitions between certain kinds of states are allowed, while others are strictly forbidden. Under more detailed calculations, the 'forbidden lines' are in fact allowed, but are millions if not billions of times less probable. Within gaseous nebulae and the solar corona, the states responsible for forbidden lines are populated by electron-ion collisions, which establish an equilibrium among the relevant states. The production rate of forbidden line photons depends on the instantaneous level populations multiplied by the decay probabilities. Given low density and enough mass (far more than can exist in the laboratory), forbidden line intensities can be very high, higher even than recombination line intensities. Forbidden lines are indicated by square brackets. The first found in gaseous nebulae were the 495.9 and 500.7 nm [O III] lines, which were eventually ascribed to the element nebulium, while the first found in the solar corona, the 530.3 nm [Fe XIV] line, was assigned to coro-nium; neither element exists. Analysis of forbidden lines in gaseous nebulae is crucial to the determination of electron temperatures, densities and chemical compositions. Forbush decrease Reduction of the flux of high energy, extrasolar cosmic rays observed at the surface of the Earth during high activity on the Sun. It occurs because solar activity produces enhancements in the magnetic field and plasma density around Earth, serving to scatter incoming cosmic rays. Such events thus occur more frequently at sunspot maximum. These events are named after Scott Forbush (1904-84), who first noted them in 1954.
fork mounting Type of equatorial mounting in which the telescope is held between two arms parallel to the polar axis. The telescope's declination axis pivots between the arms. Forty-seven Tucanae (47 Tucanae; NGC 104) Second-brightest globular cluster, after omega centauri, at mag. +4.0. 47 Tucanae is relatively close, at a distance of 13,000 l.y., and has an apparent diameter of 31'. Its actual diameter is 120 l.y. 47 Tucanae is found 2°.5 west of the Small Magellanic Cloud (RA 07h 24m.1 dec. —72°05') but is some 15 times closer. Spectral analysis of its stars suggests 47 Tucanae to be younger than most other globular clusters. forward scattering Reflection of light back towards the direction of the light source by an angle less than or equal to 90°. Light may be scattered from its direction of travel by fine particles of matter, either gas or dust. For particles significantly larger than the wavelength of the incident light, reflection or backscattering of the light occurs. Foucault, (Jean Bernard) Leon (1819-68) French physicist who in 1851 used a long pendulum of his own design to demonstrate the Earth's rotation. A foucault pendulum precesses in a clockwise direction with an angular speed equal to co sin 0, where co is the angular speed of the Earth's rotation and 0 is the observer's latitude. Working at Paris Observatory, Foucault invented the Foucault knife-edge test for mirrors and lenses, and silver coatings for mirrors. He was the first to photograph the Sun, and he invented the heliostat. He also devised an accurate method for measuring the speed of light. Foucault pendulum Device to show that the Earth is truly rotating in space. Leon foucault noticed that a pendulum in the form of a weight suspended on a wire continued to swing in the same plane while its support was rotated. In 1851 he set up a 67-m (220-ft) pendulum in the Paris Pantheon, the swing of which moved clockwise by about 2 mm between each complete back and forth movement. This apparent rotation of the pendulum is actually due to the Earth rotating beneath the pendulum while the latter, through inertia, maintains its orientation in space. fourth contact (last contact) In a solar eclipse, moment when the trailing limb of the Moon exits the solar disk. In a LUNAR ECLIPSE, fourth contact occurs when the Moon re-emerges completely into sunlight from Earth's UMBRA. In either case, fourth contact is the end of the eclipse. Fowler, William Alfred (1911-95) American astrophysicist who explained the thermonuclear reactions that take place inside stars, and calculated their rates. He spent his entire career (1933-95) at the California Institute of Technology and its Kellogg Radiation Laboratory, where the staff made many fundamental discoveries in nuclear physics by accelerating positive ions to high velocities to produce neutrons, positrons and gamma rays by bombardment. These experiments enabled Fowler to make the first measurement (in 1934 while he was still a graduate student) of the reactions involved in the CARBON—NITROGEN—OXYGEN CYCLE in stars - he detected gamma rays emitted when carbon nuclei bombarded with protons captured one of the protons to make 13N, which itself emitted a positron. Within two years, Fowler's group had discovered many more examples of these 'radiative captures', which proved to be of fundamental importance in understanding the energy processes of stars. In 1939 Hans BETHE and Carl von WEIZSACKER independently demonstrated how the carbon and nitrogen isotopes identified by Fowler and his colleagues were involved in converting hydrogen into helium inside stars. After World War II, Fowler resumed his investigations of the thermonuclear power sources of the Sun and similar stars, developing experimental proof of the chain reactions that produce the 'heavy elements' (beyond helium). In 1957 Fowler co-authored, with Margaret and Geoffrey BURBIDGE and Fred HOYLE, the seminal paper 'Synthesis of the elements in stars', published in Reviews of Modern Physics and dubbed 'B2FH' after its authors, which set forth the basic mechanisms by which stars synthesize chemical elements heavier than hydrogen and helium. In the 1960s and 1970s, Fowler's research interests included the synthesis of hydrogen, deuterium and helium in the 'hot' Big Bang, massive stars and supernovae, solar neutrinos, quasars and cosmology. He was awarded the 1983 Nobel Prize for Physics for his measurements of the thermonuclear rates in stars. Franklin-Adams charts First wide-field photographic SURVEY of the complete sky, accomplished by John Franklin-Adams (1843—1912) using a specially constructed wide-field 250-mm (10-in.) refractor known as the Franklin-Adams camera. The survey, published in 1913—14 as Photographic Chart of the Sky, consists of 206 plates of about 15° X 15° each, taken between 1903 and 1912 from Godalming, England, and Johannesburg, South Africa. With a limiting magnitude of around 16, these charts represent an historical record that is still used for studies of long-period variables. Fraunhofer, Joseph von (1787—1826) Bavarian optician and pioneer of solar spectroscopy. In 1806 he joined the Munich optical firm of Reichenbach, Utzschneider u. Leibherr and began to make achromatic objectives for surveying instruments, improving the methods for polishing and grinding them. His work was of such high quality that by 1809 Joseph von Utzschneider (d.1839) had placed him in charge of the firm's glass-making facility at Benediktbeuern. There, Fraunhofer began detailed investigations of the optical properties of different kinds of glass, commencing a lifelong search for the perfectly achromatic lens. His methods of glass- and lens-making allowed his firm to produce superb refracting telescopes of greater apertures than had previously been feasible. Among them were the Dorpat (now Tartu, Estonia) 240-mm (9 -in.) refractor used by Wilhelm von STRUVE to discover many double stars, and the Konigsberg 158mm (61 -in.) heliometer with which Friedrich Wilhelm BESSEL measured the first stellar parallax. Fraunhofer also constructed one of the earliest examples of the 'German' EQUATORIAL MOUNTING. Forty-seven Tucanae The splendidly rich, bright southern globular cluster 47 Tucanae is surpassed only by Omega Centauri. 47 Tucanae is readily visible to the naked eye. Fracastorius Lunar crater (21°S 33°E), 97 km (60 mi) in diameter. Fracastorius is flooded with the lavas that flooded the Nectaris Basin and only the highest parts of the northern wall are still visible. The floor is smooth from the lava resurfacing, but the highest part of the central peak is still visible. A long shallow rille nearly bisects Fracastorius. The walls are deeply incised by later impacts, revealing this crater's great age. fractional method Way of visually estimating the magnitude of a VARIABLE STAR. It consists of estimating the brightness of the variable as a fraction of the interval between two comparison stars (A and B, say). If it were judged to be exactly midway between them, the estimate is written as A(1)V(1)B; if it is one quarter of the way from A (the brighter) to B (the fainter), and hence three-quarters of the way from B to A, the estimate is recorded as A(1)V(3)B. The magnitude may subsequently be calculated from the known magnitudes of the comparisons. The method has the advantage that the magnitudes of the comparisons need not be known in advance, but it is best suited to sequences that have comparisons at approximately 0.5 mag. intervals, because for physiological and psychological reasons, magnitude intervals (however great) cannot be subdivided beyond a ratio of approximately 1:4 or 1:5.
frame of reference Position against which measurements can be made. It is usually advisable to use a non-accelerated or inertial frame of reference when making measurements. The laws of physics can be simpler in certain frames of reference as compared with the light from a candle. Instead of bright emission lines, he saw dark absorption lines at the same place in the solar spectrum. William Hyde wollaston had first observed these dark features in 1802, but because Fraunhofer studied them in much greater detail they came to be called fraunhofer lines. This discovery led to the development of astronomical spectroscopy. To further these researches, Fraunhofer designed a dividing engine to manufacture diffraction gratings with 4000 parallel lines per centimetre, which he used to measure the wavelengths of over 500 different solar spectral features. He found that the most prominent lines are produced by atoms and ions of calcium, hydrogen, sodium, magnesium and iron. Fraunhofer lines absorption lines in the spectrum, first noted and catalogued in sunlight by Joseph von fraunhofer in the early 19th century. Lettered from A to K, the Fraunhofer lines are the strongest in the solar spectrum, and are prominent in the spectra of other stars. Fraunhofer lines Dark lines interrupt the continuum of the solar spectrum. These result from absorption of light at specific wavelengths by atomic species in the Sun’s atmosphere, and allow the types present and their abundances to be determined. In spite of possible confusion with chemical symbols, the various Fraunhofer designations are still in common use, particularly 'D' for neutral sodium at 589.6 and 589.0 nm (D1 and D2, respectively), 'G' for a band of CH (carbon and hydrogen, chemically bound, plus other absorptions) at 430.0 nm, and 'H' and 'K' for ionized calcium at 396.8 and 393.4 nm. Small 'g' and 'D3' were added later to indicate neutral calcium at 422.7 nm and neutral helium at 587.6 nm. Fred L. Whipple Observatory (FLWO) Largest facility of the smithsonian astrophysical observatory, situated on Mount Hopkins near Amado, 60 km (35 mi) south of Tucson, Arizona; it has been in operation since 1968. The FLWO is home to the mmt observatory, whose 6.5-m (256-in.) telescope occupies the highest point on the site at an elevation of 2600 m (8550 ft). Other instruments are 1.5-m (60-in.) and 1.2-m (48-in.) reflectors and a 10-m (33-ft) gamma-ray telescope. The 1.3-m (51-in.) infrared telescope of the two micron all sky survey (2MASS) is also located on Mount Hopkins. free-free transition Radiation emitted when a free electron is decelerated in the vicinity of an ion without being captured. It is also known as Bremsstrahlung ('braking radiation'). Friedman, Herbert (1916-2000) American astrophysicist who helped to found X-ray astronomy, using rocket-borne detectors to demonstrate the existence of extraterrestrial X-ray sources. After carrying out important studies of the Sun's X-ray emissions in the 1940s and 1950s, in 1964 Friedman discovered the first X-ray source outside the Solar System, finding that the Crab Nebula, a supernova remnant, is a powerful X-ray emitter. Friedmann, Aleksandr Aleksandrovich (1888-1925) Russian mathematician who in 1922 worked out the basic details of the expanding universe. He solved Einstein's field equations for the general theory of relativity, obtaining several solutions all suggesting a universe that was isotropic, or uniform in all directions, but was not static. This set of models is known collectively as the friedmann universe. Friedmann's work was not influential at the time, and it remained unknown to Edwin hubble. Friedmann universe Cosmological model developed by Aleksandr friedmann and others, based on Einstein's theory of general relativity. It described a universe that is homogeneous and isotropic. Specifically, mass and energy are evenly distributed at the largest of scales. Following these assumptions, the field equations can be solved for the entire universe. This type of universe provides the basis for modern-day big bang models. F ring Narrow outer ring of saturn; it was first observed from pioneer 11 in 1979 and in more detail during the voyager encounters. The F ring has a narrow, 'braided' structure, governed by the gravitational influence of small satellites orbiting close to it. It lies 140,200 km (87,100 mi) from the planet's centre. 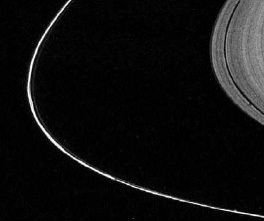 F ring Imaged by the Voyager 1 spacecraft during its 1980 flyby, the ‘braided’ outer F ring of Saturn is shepherded by a pair of small, near coorbiting satellites. fringes Patterns of light and dark produced by the interference of light waves that are alternately in and out of phase with each other. A simple example can be produced by placing a convex lens on a sheet of plane glass. Interference fringes in the form of rings will be seen around the point of contact. Fringes provide the optical engineer with a very powerful tool for measuring the quality of optical surfaces because minor variations can cause large changes in the shape or position of fringes. F star Any member of a class of yellow-white stars, the spectra of which are characterized by weakened, though still strong, hydrogen lines, strong ionized calcium (Fraunhofer H and K), and other ionized metal lines. main-sequence dwarfs range from 6000 K at F9 to 7000 K at F0, with zero-age masses from 1.05 to 1.6 solar masses, zero-age luminosities from just above solar to 5 solar, and dwarf lifetimes from just under 10 billion to 2.5 billion years. Evolved F dwarfs can have masses up to twice that of the Sun. Class F giants and supergiants (which can have much higher masses) are distinguished by the ratios of the strengths of ionized to neutral metal absorptions. F subdwarfs have weakened metal lines, lower metal abundances, and appear hotter than they really are. Chemically peculiar am stars and ap stars run into class F, where they are known as 'Fm' and 'Fp'. Class F Stars are distinguished by fundamental changes in stellar behaviour. Envelope convection diminishes with increasing mass and disappears near F0, where the carbon cycle begins to dominate the proton-proton chain. Rotation speeds increase as the convection layer and the associated magnetic braking die away. The Sun spins at only 2 km/s (1.2 mi/s), but by F5 the typical speed is more like 30 km/s (19 mi/s), and at F0 it has climbed to 100 km/s (62 mi/s), although some stars of course still rotate slowly). Class F is the great bastion of the cepheid variables, which occupy an instability strip in the Hertzsprung-Russell diagram extending from super-giants in class G down through F supergiants and giants. Where the strip cuts across the Population II horizontal branch, the rr lyrae stars of classes F and A are found. Population II Cepheids (w virginis stars) are also F bright giants. Bright examples of F stars include Porrima (7 Virginis) F0 V, Procyon F5 IV, Canopus F0 II and Polaris F5 Ia. fundamental catalogue Catalogue of fundamental stars whose positions and proper motions are accurately known and against which the relative position of other celestial objects may be measured. The first such catalogue was prepared by EW. bessel in 1830. Particularly important has been the FK (Fundamental Katalog) series compiled in Germany, the latest of which is the FK5 Part II. Also known as the FK5 Extension, this catalogue provides mean positions and proper motions at equinox and epoch J2000.0 for 3117 new fundamental stars. It extends the fundamental system defined by FK 5 Part I, which was published in 1988, to about magnitude 9.5. More than 200 existing catalogues were used in the compilation of the FK5 Extension. Work is currently underway on the Sixth Catalogue of Fundamental Stars (FK6), which combines observations from the hipparcos astrometric satellite with the groundbased data of the basic FK5. The FK6 will be the catalogue with the most accurate proper motions yet published. fundamental forces In all of physics, every particle discovered and every interaction observed can be explained by the existence of just four fundamental forces of nature. These forces are the electromagnetic force, the gravitational force, the strong force and the weak force. The electromagnetic force and the gravitational force are most evident in our everyday lives since they describe chemical reactions, light and the Earth's gravitational field. It first seemed that electrical forces and magnetic forces were separate and independent, but investigations into each phenomenon led to underlying similarities. James Clerk maxwell finally combined the forces and wrote down his famous equations, which described all electrical and magnetic phenomena and explained how magnetic fields could be generated by electrical currents and vice versa. This system of differential equations also yielded a wave solution, and the wave propagated at the speed of light. Thus light was finally understood in terms of electric and magnetic fluctuations that needed no medium through which to propagate. Both the electromagnetic force and the gravitational force are inverse square forces in the sense that the strength of the field declines with the inverse square of the distance, and both forces have infinite range. A major difference between the electromagnetic force and the gravitational force is that the former is easily quantized, with the exchange particle being the photon. Gravity on the other hand has defied quantification, and the most successful gravitational theory to date is Einstein's theory of general relativity, which is a continuum theory. Attempts have been made to quantize gravity but with little success; a proposed particle of gravitational quanta is called the graviton. The strong force and weak force are both very strong forces, but have extremely limited range. The strong force operates inside the atomic nucleus and essentially holds the protons and neutrons together by the exchange of particles called gluons. The actual exchange of gluons is between the quarks that make up protons and neutrons. The strong force is the strongest of the four fundamental forces, but its range is limited to distances of the order of 10-15 m. The weak force also operates inside the nucleus and is important in radioactive decays. The intermediate vector boson is the exchange particle and its range is confined to a distance of the order of 10-16 m.
Although the strong and weak force are relatively < F ring Imaged by the strong compared with the gravitational force, their limit- Voyager 1 spacecraft during its ed range makes them unimportant in cosmological con- 1980 flyby, the 'braided' outer cerns, except close to the beginning of the Big Bang. F ring of Saturn is shepherded The electromagnetic force is much stronger than the by a pair of small, near co-gravitational force, but since it comes with roughly equal orbiting satellites. numbers of opposite charges which neutralize each other, on cosmological scales it is less important than gravity. Thus the weakest of the four fundamental forces dominates the evolution of the universe. All of the forces except for gravity are easily understood within the framework of quantum theory. This fundamental difference between gravity and the other forces comes into play in the early universe. It is thought that under the hot and dense conditions of the early universe the electromagnetic force and the weak force combined into one force. Some time later this super-force then combined with the strong force. At very early times, shortly after the Big Bang, gravity must have joined and become one with the strong electroweak force. However, owing to the nature of general relativity, no quantum theory of gravity has been found, and the mathematics describing the fundamental forces disallows this unification. The unification of the four fundamental forces of physics is the ultimate goal of physics (see theory of everything). Even Einstein spent some time working on the problem to no avail. Recent ideas such as super-string theory claim to have accomplished unification, but at a price of postulating many unobserved dimensions of our Universe. fundamental stars Reference stars whose positions and proper motions have been observed and established over a long period of time to a high degree of accuracy. A measurement of the position of a star (that is, its right ascension and declination) is defined as being 'absolute' if it does not make use of the already known positions of other stars. Absolute positions are obtained from specialist instruments such as the carlsberg meridian telescope and the hipparcos astrometric satellite. The coordinates and proper motions of fundamental reference stars, selected by the International Astronomical Union, are contained in a fundamental catalogue. The system of fundamental stars provides the best available approximation to an inertial frame of reference, relative to which positions of all other celestial objects can be measured. FU Orionis star (FU, fuor) Young star that increases in brightness by some 5-6 mag. over a period of months, following which it may remain in a permanent bright state or suffer a slight decline. Objects in this small group are believed to represent one of the evolutionary stages exhibited by young ttauri stars. All known examples (about 10 in number) are associated with cometary nebulae. fusion, nuclear Process in which two light atomic nuclei join together to form the nucleus of a heavier atom. In the very high temperatures found in the core of the Sun (about 15.6 million K) two hydrogen nuclei are fused together to give a deuterium nucleus, plus a positron and a neutrino. Later stages in this fusion process eventually produce the nucleus of helium. Such processes are called nuclear reactions. With light elements, the binding energy per nucleon increases during nuclear fusion and so vast amounts of energy are released. The fusion of elements up to the iron-peak results in the production of energy. The fusion of nuclei heavier than iron requires there to be an input of energy to keep the reaction going, and thus mainly occurs during supernova explosions. Fusion is the energy-producing process in most stars. The formation of elements up to iron by fusion is called nucleosynthesis. See also fission, nuclear.